What's Trending? Weathertech Floor Liners are Perfect for Winter Slop! Winter is about to set in and the snow, ice, and slop will soon be trekked around on our shoes... everywhere we go... especially our cars! If you are looking for the ultimate floor protection for your car's interior during this winter (and all other seasons), then you will want to consider Weathertech floor liners. These floor liners are laser measured to cover every inch of space underneath your feet, ensuring no spot as unprotected. They also wrap up the edges of the floor to contain wet messes like melted snow or beverage spills. To clean, simply remove the liners, rinse them off, or use a mild all-purpose cleaner. You can expect them to last over 10 years, this is an investment that will really stand up to all the use that are vehicles receive. Stop by our Housewares department for a closer look at these floor mats. If you are interested in ordering them for your vehicle, our sales clerks would be happy to assist you with that purchase. They only take about a week to arrive! They also make for a great gift. 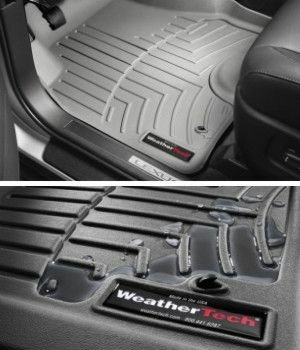 Be sure your car is protected from the winter elements this year and consider custom-fit Weathertech Floor Liners.